CocoRosie's exquisite songs prove ravishingly entertaining live. An evening with the band is fantastic fun, the songwriting Casady sisters blend hip-hop beats, tuneful 1920s sentimentality, and opera with evocations of a poetical otherworld, delivered by their two contrasting voices. Sierra Casady was the vocal and visual center of the show at The Music Box in Hollywood on October 6. Her incantatory, floaty voice and exciting stage presence energized a set that harmonized Gael Rakotondrabe's glorious piano/keyboards and Tez's jaw-dropping beatbox gifts, with sister Bianca's ruthless word wizardry. But a fusion infusion calls as Sierra's soprano thrills us with those old, best ecstasies, while Bianca growl-raps the child's -- every child's -- difficulties, demands, observations, agonies: what is seen as contrivance in the aesthetics of CocoRosie is a projection onto these artists of a brutal rupture our culture has, in fact, contrived. The Casadys have hip-hopped and patty-caked and hopscotched their way into our culture's most essential elusive subject matter. How might a motivated listener bypass any internalized resistance and savor a hit of their own dreamtime? Art is the medicine. Quiet the mind a little. Revisit Meg White 'In the Cold, Cold Night.' Find Old Time/Appalachian's Olabelle Reed's 'My Epitaph.' Pour on the Elizabeth Fraser, Kate Bush or Tori Amos. Hop over to a golden oldie, Clarence 'Frogman' Henry's classic 'Aint Got A Home.' (He sings "like a girl" and also "like a frog," anticipating Sierra's and Bianca's respective strategies; they're not so unusual after all.) Listen to Loretta Lynn's 'One on the Way,' chock full of the sounds of maternal multitasking, magic, pragmatism, heartbreak. Watch a clip of Janet Gaynor in Murnau's silent film Sunrise to really register once and for all how we as a culture, generation after generation, make the mothers we so desperately need vulnerable to violence, and to annihilating despair. Consider a masterwork by a giant of twentieth-century art: Edna St. Vincent Millay's (1892- 1950) "The Ballad of the Harp-Weaver." This great poet, (nicknamed Vincent) dutiful daughter, devoted sister, described by Publishers Weekly with the impressive phrase 'sexually implacable,' tears our hearts open permanently with the subjects of what mothers give, what society begrudges them, and what, precisely, is the length, depth, breadth, height of what we -- eternally -- need and want from only this source. Consider the aspirations of CocoRosie's mystical hip-hop/dreampop in this stunning pink light. Click to watch a clip of Murnau's film Sunrise starring Janet Gaynor. CocoRosie's music lives, breathes, discloses, the authentic continuum of time each of us has lived; it articulates the ambient blur of the mother-baby dyad and sings out the faltering steps and unsurpassed intensities of childhood. The band makes effective, revelatory art that rocks the cradle where you -- in memory -- lay. The Casady sisters rock and rock and rock. We Are The World opened with powerful performance art choreography interpreting bass-boasting electronica. 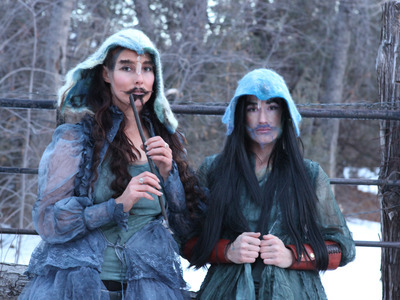 CocoRosie's international tour continues: Click this link to listen to their music or to get info on their MySpace page.